Rehabilitation programmes are conducted both in the Rehabilitation Centre and at the client’s residence, and their implementation ensures the conditions for people with disabilities to achieve enhanced social inclusion. Long cane technique programme makes possible for visually impaired persons to achieve independent mobility on familiar routes, to orientate themselves through their residual senses and mental capacity, to master traffic rules, to use the stairs safely, to use public transportation, etc. “Tom Pouce” Electronic Travel Aid Device, is an infrared proximeter that detects obstacles in the covered fields of view (including those above a fixed threshold) and vibrates to alert visually impaired person, thus providing an additional protection and security. The precondition for the participation in this programme is the ability of a person to use the sliding technique with a long cane and to have experience in moving independently. guide a visually impaired person to the designated target (marked zebra crossing, doors, arm of a chair, tram/bus stop). Within the programme clients are trained to basic care and grooming of dogs. Guide dog user should know the route of travel and give commands to their dog about the direction of travel (left, right, back…), and the dog then finds the safest solution. 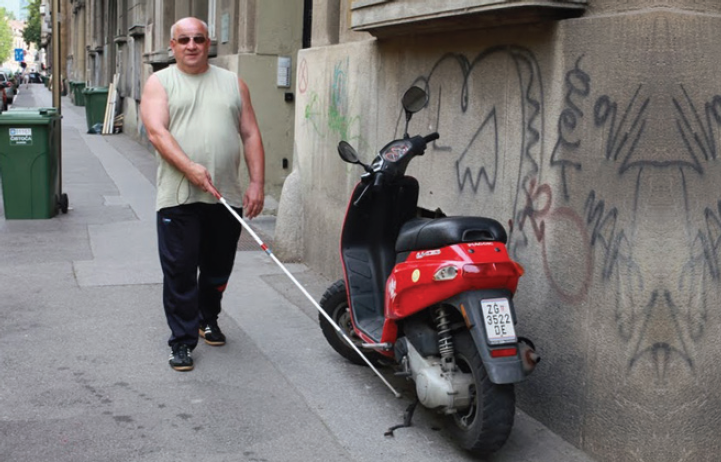 On the basis of the previous orientation and mobility education and independent traveling, the blind person estimates the traffic and gives the dog commands about when to cross a road. Service dog programme makes it possible for the people in wheelchairs and the people with severe mobility difficulties to learn the skills to use the aid of service dog to get and carry things, open/close doors, drawers, washing machines, transfer to the wheelchair and out, and other specific needs and, in addition, to learn about the basic dog grooming and care. 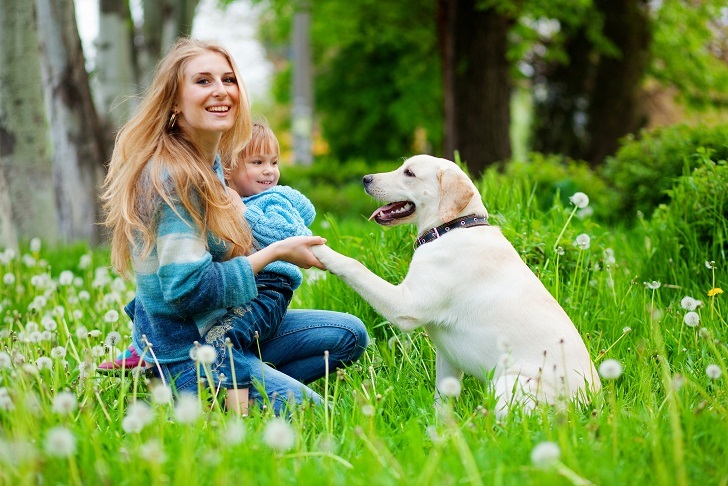 Service dog for children programme makes it possible for a parent – a therapy/service dog handler to include the dog into the rehabilitation process of a child with developmental difficulties and the improvements are noticeable in sensorimotor, cognitive, communicative, psychosocial and emotional development of children. Likewise, a service dog can be given to a professional teacher (a person who includes a service dog into their professional work). Teachers are also trained to basic dog care and grooming within this programme. as a motivator in daily activities and existing rehabilitation processes of a child with developmental difficulties. In the Centre, we carry out daily therapies for children with developmental difficulties, working on therehabilitation with service dogs during school year. The programme is adjusted individually to each user depending on their needs and abilities. In this way, it improves their emotional, cognitive, motor and psychosocial development/condition. Half day care in the Centre embraces persons with intellectual disabilities and multiple disorders and this programme, apart from consolidating the acquired skills, also develops new ones. This programme includes: the development of communicative skills, self-representation, development and improvement of social connections, daily life activities, service dog activities, art workshops, etc. The Centre carries out the dog breeding, puppy walking and assistance dog training programmes, according to the internationally recognized standards. The breeding programme for own needs is based on Labrador retriever and Golden retriever breeds, since these breeds have shown the best level of adjustment in the very demanding training of service dogs. The puppy walking programme begins with the selection of puppies and testing of their genetic predispositions, when they are six to eight weeks old. The chosen puppy grows up in a family of volunteers where it gets used to various situations in human daily life, and where it learns basic rules of behaviour and obedience. During the puppy walking, the Centre Silver provides a professional assistance to these families and compensates for all expenses of food, equipment and veterinary services. On the completion of the puppy walking period, being 16 – 18 months old, the dogs are introduced to the training programme. During the first two months of training, all dogs have the same programme and then, after the assessment made by instructors, they are admitted to guide dog, service dog or service dog for children programme. 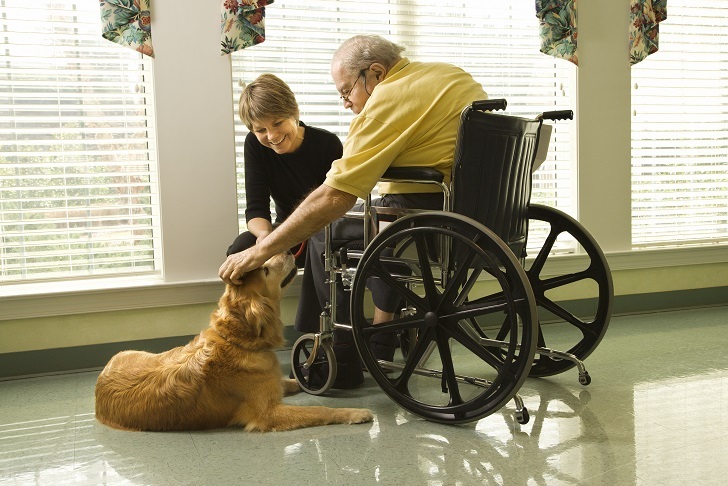 In the final phase of training, dogs’ skills are adjusted to the specific needs of users. It takes eight months of training to complete this programme, regardless of the type. By carrying out educative activities, the Centre influences the raising of consciousness of persons with disabilities and of public consciousness, likewise. Educative activities involve organized visits of interested groups to the Centre, and the visits of professionals from the Centre to the associations of disabled people, to kindergartens, primary and secondary schools, social care institutions, faculties, etc.